A Country Holiday - This bright and festive outfit is perfect for our upcoming holiday season. Create a beautiful picture of your wee lad by a cozy fire or sitting under the Christmas tree waiting for Santa. 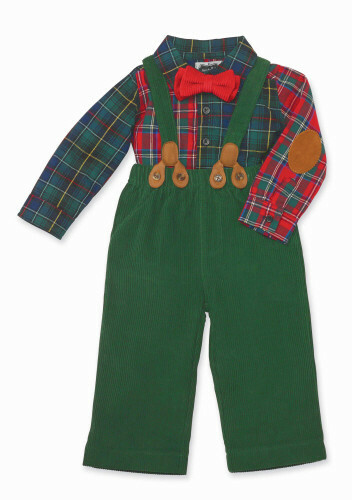 This 3-piece set includes a long sleeve button down cotton holiday plaid shirt, green corduroy pants with matching suspenders and a removable Velcro corduroy bow tie. Runs true to size. 100% cotton. Machine wash cool except for the bow tie which should be hand washed.